The US space agency has renamed its mission to "touch the Sun" after a living scientist. The Solar Probe Plus mission will now carry the name of Eugene Parker, who conducted pioneering work on the "solar wind" - a stream of charged particles flowing out from the Sun's "atmosphere". 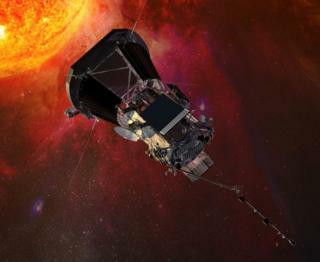 The spacecraft will swoop to within four million miles of the Sun's surface, enduring temperatures of about 2,500C. The mission is due to launch in 2018. "Nasa has never named a spacecraft after a researcher during their lifetime," said Thomas Zurbuchen, the head of Nasa's science mission directorate. The change, which comes a few days before Prof Parker's 90th birthday, means that Solar Probe Plus, will now be known as the Parker Solar Probe. The mission was originally announced in 2009, and is set to launch next year from Florida's Kennedy Space Center on a Delta IV Heavy rocket. Nasa scientist Nicola Fox, commented: "I like to call it the coolest, hottest mission under the Sun." The spacecraft will travel through part of the Sun's atmosphere, closer to its surface than any manmade object before. The aim is to better understand the upper layer of this atmosphere, known as the corona. It should also expand our knowledge of the origin and evolution of the solar wind. The spacecraft will be protected from the scorching temperatures by a specially developed carbon-composite shield. The European Space Agency (Esa) plans to launch its own mission to the Sun, named Solar Orbiter, in February 2019.